IN THE NEWS - The Current Truth Network, Washington, D.C.
Today the secret FISA court that enabled the spying on and gathering of data on Americans issued a statement stating it is not the rubber stamp of the government. Recent leaks of classified documents have pointed to the role of the special court in enabling the government’s secret surveillance programs, but members of the court are chafing at the suggestion that they were collaborating with the executive branch. When specifically asked by this reporter what the content of the statement they signed today said on the matter none of the judges knew exactly what they'd signed. The statement that they are not a rubber stamp of the executive branch originated from the NSA and was in the daily file along with several warrants for their approval. "We read so many things that come across our desk it's hard to really remember what they put in front of me," Kathy-Koller explained. I believe Chief Judge Walton just gave the stamp to Holder ... eliminate the middleman... saves time. This sort of reminds me of the French presidential candidate who wants to eliminate "the monopoly ministry" because there is only one. This is not a rubber stamp! Obama: "Don't trust your lying eyes.Put your trust in the government! And this is not a hammer and sickle." This is not a repudiation of the Muslim Brotherhood. Ceci n'est pas une marque en caoutchouc.
" 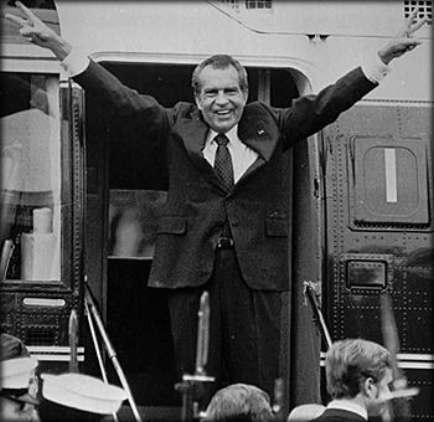 I am not a crook..."
"I am not trying to hypnotize low-information voters"
Whoops. Another FISA court application rubber stamped. What do you call an Obama judge?